Minimises white marks on clothes. For 24-hour effective odour protection. 0% Aluminium Chlorohydrate, 0% ethyl alcohol and 0% parabens. Dermatologically tested. Enjoy effective odour protection for healthy skin without Aluminum Chlorohydrate, parabens or alcohol. 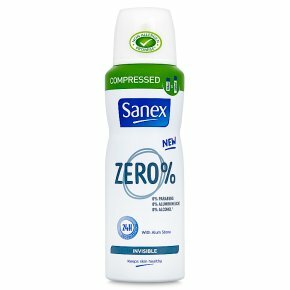 New Sanex Zero% Invisible Compressed Deodorant* minimises white marks on clothing and keeps you fresh for 24 hours. Be gentle on yourself and your wardrobe. *Lasts as long as Sanex 250ml deodorant.